Kick off your visit on the 24th (Wed): see the interesting displays at Atomium, contemplate the long history of Grand Place, and then appreciate the history behind Manneken Pis. On the next day, see the interesting displays at MIM - Musical Instruments Museum, examine the collection at Musées Royaux des Beaux-Arts de Belgique, and then contemplate in the serene atmosphere at St. Michael and St. Gudula Cathedral (Cathedrale St-Michel et Ste-Gudule). For reviews, ratings, maps, and tourist information, refer to the Brussels vacation planner. Vienna, Austria to Brussels is an approximately 4.5-hour flight. You can also drive; or take a train. While traveling from Vienna, expect a bit cooler days and about the same nights in Brussels, ranging from highs of 15°C to lows of 4°C. Wrap up your sightseeing on the 25th (Thu) early enough to take a train to Bruges. On the 26th (Fri), get engrossed in the history at Groeningemuseum, go for a walk through Walplein, then indulge your thirst for a good beer at Huisbrouwerij De Halve Maan, and finally steep yourself in history at Historic Centre of Brugge. Get ready for a full day of sightseeing on the 27th (Sat): examine the collection at Choco-Story - The Chocolate Museum, don't miss a visit to The Markt, then explore the activities along Minnewater Lake, then contemplate in the serene atmosphere at Basilica of the Holy Blood, and finally admire the landmark architecture of Belfry of Bruges. 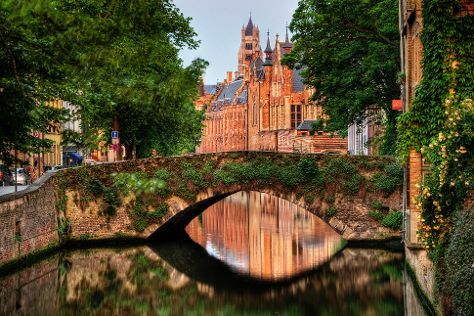 To find where to stay, photos, more things to do, and other tourist information, use the Bruges driving holiday planning site . Traveling by train from Brussels to Bruges takes 1.5 hours. Alternatively, you can drive; or take a bus. In April, daily temperatures in Bruges can reach 15°C, while at night they dip to 5°C. Wrap up your sightseeing on the 27th (Sat) to allow time to drive to Amsterdam. Amsterdam is known for museums, nightlife, parks, breweries & distilleries, and shopping. Your plan includes some of its best attractions: explore the world behind art at Van Gogh Museum, stroll through Vondelpark, browse the eclectic array of goods at Albert Cuyp Market, and have fun at Museumphoto. Make your Amsterdam itinerary with Inspirock to find out what to see and where to go. Traveling by car from Bruges to Amsterdam takes 3 hours. Alternatively, you can take a train; or do a combination of train and flight. April in Amsterdam sees daily highs of 15°C and lows of 5°C at night. Finish your sightseeing early on the 30th (Tue) so you can travel to Berlin. Kick off your visit on the 1st (Wed): explore the world behind art at Pergamonmuseum, get a sense of history and politics at Reichstag Building, then pause for some photo ops at The Holocaust Memorial - Memorial to the Murdered Jews of Europe, and finally pause for some photo ops at Brandenburg Gate. On the next day, examine the collection at Topography of Terror, then take in the local highlights with Walking tours, and then steep yourself in history at East Side Gallery. For other places to visit and tourist information, read Berlin trip itinerary builder website . Fly from Amsterdam to Berlin in 4.5 hours. Alternatively, you can do a combination of train and flight; or drive. Finish your sightseeing early on the 2nd (Thu) to allow enough time to travel back home.